Home Costs > How Much Does a Snow Blower Cost? How Much Does a Snow Blower Cost? Snow blowers, also called snow throwers, can make the winter months much easier. Shoveling can be strenuous and time-consuming; however, using a gas or electric snow blower can make the job of snow removal much easier. Snow blowers come in a great variety of sizes, horsepowers, and stages. Therefore, the price range is quite large. Snow blowers can cost anywhere from $200 to $1000. For example, the Greenworks 26032 is a lower-end electric snow blower that is 20 inches wide and will cost about $200. The Murray 1695537 is gas powered, wider, and will cost around $400. It is a single-stage snow blower, meaning that it only has one set of blades, that it can clear snow up to one foot in depth, that it provides some momentum but will need to be pushed, and that it cannot be used on gravel or rough surfaces – only smooth paved driveways. A two-stage snow blower has two sets of blades – one that cuts through the ice and hard snow and one that is smooth to pick up and throw the snow up the chute. These types of snow blowers do not make any direct contact with the ground and can, therefore, be used on any type of surface. A two-stage snow blower is usually capable of going in forward and reverse, and can usually clear snow up to almost three feet in depth. An example of this type of snow blower is the Powerland PDST-32, which will cost about $900. An electric snow blower will require an outlet as well as an extension cord. An electric snow blower can cost anywhere from $85 to $600. The wider the blower is, the more it will cost. A two-stage snow blower that runs on gasoline can cost anywhere from $299 to $1,400 depending on the brand and size. What is going to be included in the estimates above? All of the batteries, cords, and blades needed to run the machine will be included. All snow blowers will come with an owner’s manual. 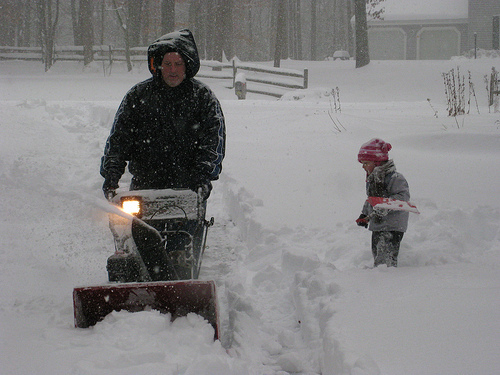 Most snow blowers come with some type of warranty – this depends on the company. An electric starter allows you to plug in your snow blower to start the engine during colder weather. The intake height may be able to be adjusted to determine how much snow it can take in. A single-hand operation allows you to make easier adjustments. The speed controls let you set the machine pace. Power steering, similar to a car, allows you to turn the snow blower with ease. Larger tires may offer better traction when maneuvering. Some may even have dual tires for a better grip. A remote control chute lets you change the direction of the chute. A joystick chute, on the other hand, will be manually controlled. An extended chute allows you to reduce the blowback of snow. A headlight may be available for visibility at night. Heated handgrips will warm your hands to make the work more comfortable. The blades on snow blowers will need to be replaced every few years. This will cost between $10 and $50 depending on the size and stage of your blower. Electric snow blowers will need a replacement battery every few years. These batteries usually cost $30 to $50. Electric snow blowers are going to require a heavy-duty, outdoor extension cord. It’s recommended that cords longer than 50 to 100 feet are purchased. These cords can start at $15. If using a gas blower or a blower that is powerful and loud, it’s ideal to purchase ear protection to drown out the sound. Gas blowers will need an oil change every 50 hours of use, and spark plugs will be needed after every 100 hours of use. Frequently purchased together, this should cost about $25. When prepping the snow blower for the season, it’s best to use a fuel stabilizer to store it for the off-season. These stabilizers can cost about $10. Sheer pins may be needed if you need to replace and/or break one. These pins can cost about $5 to $10. According to snowblowersdirect.com, plan on spending about $72.39 per year to maintain your snow blower. Always wear tight-fitting clothing when using a snow blower. Loose fitting clothing has a better chance of getting caught in the blades. Always wait for the unit to cool down before filling up with gas. Also, before cleaning it, always wait for it to cool as well. Don’t purchase a snow blower that is too big. It’s ideal to purchase a two-stage blower for those that have a driveway wider than 25″. For an electric blower, consider it for smaller sidewalks and spaces that receive lighter, fluffier snow. Measure the width of your driveway and make sure you choose the right size. If you need to use this snow blower on steep terrains, be sure it’s built for this rugged terrain. Wet and heavy snow can often clog the snow blower’s chutes. If you live in an area prone to this, it’s ideal to look for a heavyweight blower that can handle this type of situation. Cold weather can often make your snow blower hard to start and to prevent this, it’s a good idea to purchase a snow blower that allows you to plug the starter into the wall. These units are lightweight, portable and very easy to use. These units are designed for smaller driveways and spaces, ideal for a driveway less than 35 feet. Requiring an outlet, an electric can work on just about any surface besides gravel. Powered on gas, these units are more powerful and ideal for larger driveways, longer than 40 feet. A gas unit is perfect for just about any snowfall range. Ideal for up to 12 inches deep and can clear paths up to 22 inches wide. This unit shouldn’t be used on gravel surfaces. One of the biggest units available, a two-stage gas unit is powerful, can clear big paths, easy to start up. This unit is ideal for larger commercial spaces and for snowfalls that receive more than 12 inches of hard, compact snow. This type of setup will need a gas and oil combination to start it. Ideal for heavy snow and can clear snow up to three feet deep. Most models can throw snow up to 50 feet and can handle heavier snow and ice. Ideal for lighter snow up to 12 inches. It is lighter in weight and is known to be more environmentally friendly. Used and refurbished snow blowers can be found through services such as Amazon, eBay, and Craigslist for a discounted price.